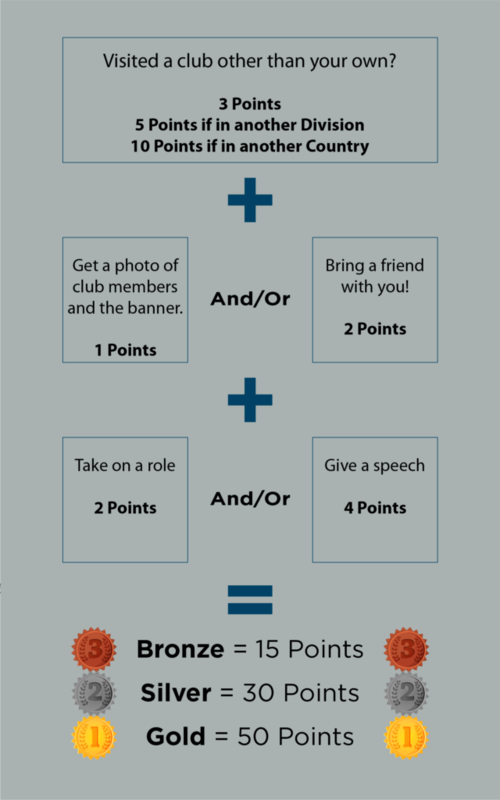 What is the Club Ambassador Programme? The Club Ambassador Programme (CAP) is an initiative that rewards those Toastmasters that are never satisfied with attending one club. The CAP promotes the frequent flyer, the explorer – those keen on leaving their comfort zone repeatedly in the pursuit of a new challenge in a new club. Any Toastmaster in District 91 can! Every time you visit another club that you are not a member of, simply record your progress on the form below, and you will collect points on the programme. You will have a chance to visit new clubs, meet new people, learn from others and share your skills with others. You might enjoy a newly invigorated passion for Toastmasters after changing your surroundings, or perhaps push yourself out of your comfort zone. The further you venture, the more roles you give and speeches you deliver, the more points you get. These go towards our three-tiered Club Ambassador Award. Why stop at Gold? The Toastmaster with the most points in September 2019 will be crowned the District’s Club Ambassador of the Year. 3) Attend, take part and enjoy! 4) Don’t forget to tell us about your visit by completing this form. Visits do not count if you are a member of the club. Visits to pre-charter clubs and demonstration meetings for new clubs do count. Tell us if this is the case on the form or in an email. If you are an area/division director, only visits to clubs outside your area/division count. Attendance at an Area & Division contest does not count as a club visit. Multiple visits to the same club do not score more points. Only visits between 1st February 2019 and 30th June 2019 will be counted as part of this year’s programme.